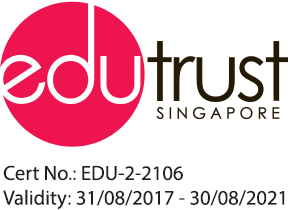 EduTrust is a voluntary certification scheme that helps to distinguish higher quality players in Singapore’s private education industry. Private education institutions (PEIs) need to be EduTrust-certified before being able to offer placement for international students who require a Student’s Pass from the Immigration and Checkpoints Authority (ICA). Refer to CPE website for more details. Under the EduTrust Certification Scheme, PEIs must adopt a Fee Protection Scheme with the CPE-appointed service providers and provide medical insurance coverage for hospitalisation and related medical treatment throughout the entire course duration.